NAI Region 2 partners with the U.S. Fish & Wildlife Service for a one day workshop at the John Heinz National Wildlife Refuge at Tinicum. 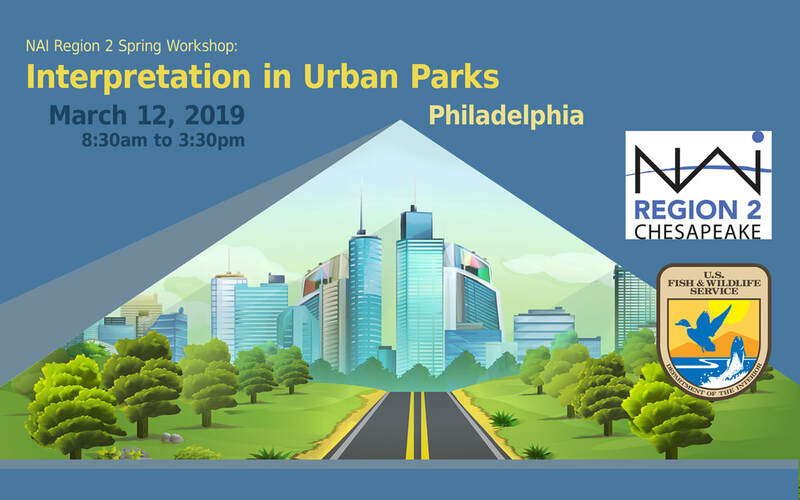 Tuesday, March 12 2019 from 8:30am to 3:30pm in Philadelphia, PA. Build your own workshop experience with two choices for each session. Description: Successful interpretive volunteers start with professional and engaging onboarding. DIY Unique Displays on a Budget! Description: Learn, share and create with this DIY display session. At the end, each participant will learn a traditional Native American way to wrap the feather for display. Increasing Minority Visitation to National Parks: What are Partners Saying? Description: Preliminary findings from research into the barriers to, and potential solutions for, increasing visitation to national parks from under-represented communities. Findings suggesting actions for creating real equity and inclusion in national parks and partner communities. Description: The First State Club was created to get Dover students involved in their local state park. Learn how the program started and how it continues to expand each school year. Description: Do you know who you serve? Do you know how they want to be served? We’ll explore how to know your community, create connections, and reap the rewards. Description: Learn how to start or manage an existing education animal collection including permiting, where to get animals, housing, diets, and how to maximize budget with cost-saving tips. Description: Develop the best programs and the finest interpreters by creating a culture of constant, supported improvement. Participants will gain tools and techniques to begin cultivating this type of supportive culture at their sites​. Presenters: Liz Androskaut, Interpretive Programs Manager Alapocas Run and Wilmington State Parks and Barbara Woodford, Interpretive Programs Manager White Clay Creek State Park. Bonus Perk: All Early Bird Registrants will be entered to win a $100 gift certificate from one of our generous sponsors, Acorn Naturalist! We're excited to host our Spring 2019 Workshop at this beautiful and ecologically significant site. With over 1000 acres, the John Heinz National Wildlife Refuge at Tinicum is Pennsylvania's largest remaining freshwater tidal marsh. Ten miles of trails meander through a landscape of rare wetland plants, framed by the Philadelphia skyline. The marsh is visited by some 280 species of resident and migratory ducks, herons, and other birds, and is the home of the endangered coastal leopard frog and red-bellied turtle. Explore the park on foot or by canoe. Thanks to everyone who submitted an application. ​Scholarships cover the registration fee of the workshop and were available to current NAI members that attend school, work, volunteer, and/or live within the region. Congratulations to Jessica Greensmith and Sean Redmiles.